You’ve noticed your aging parent spending more time sitting in their favorite recliner when you stop over for a visit. Their days of gardening seem to be diminishing as the aches and pains of arthritis set in. Their good friend down the street has just moved into an assisted living facility in another town and they have recently had to relinquish their driving privileges due to physical limitations. You notice their once cheerful outlook has developed an aura of melancholy. The elderly face an enormous amount of change, sometimes at a sprinter’s pace. This can leave the best of attitudes shifting into moods of indifference that can ultimately lead to depression. Now is the time to consider a pet. 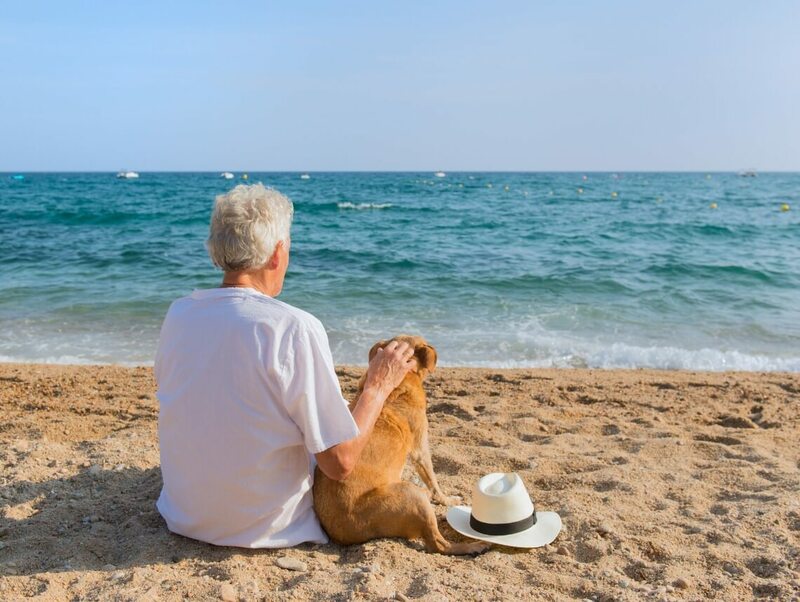 The benefits of pet ownership for many people are vast, but for seniors facing increasing isolation, they can be a lifesaver. A study conducted at Brooklyn College in New York found that “The presence of a pet was the strongest social predictor of survival” after patients were discharged from the hospital for heart disease. The reasons for this are probably two-fold: companionship and exercise. Simply watching a fish tank or petting an animal’s coat can provide soothing benefits for seniors. Studies show that interacting with a pet can not only lower an individual’s blood pressure but also reduce levels of cortisol, a stress inducing hormone. Pet therapy has also been shown to increase oxytocin and dopamine, hormones responsible for feelings of happiness and relaxation. Pets are especially beneficial for Alzheimer’s patients, providing a source of positive, non-verbal communication that helps ease stress and reduce outbursts of anxiety and aggression. If you’ve ever had a dog jump up and start giving you face hugs just as the tears began to flow, you know what a pet offers in the way of consolation and companionship. They become an integral part of one’s life and a strong contributor to increasing one’s quality of life. For years, pet therapy has been used in nursing homes, hospitals, and military bases to treat depression, prevent loneliness, and promote healing. When pets shower us with unconditional love and affection, it’s difficult to feel alone. For homebound seniors, having a constant companion provides entertainment and temporary comfort from physical or emotional pain, helping to improve the overall quality of life. Exercise doesn’t have to be extensive and certainly doesn’t need to take place in a gym to benefit one’s health. For seniors with limited mobility, the duties that come along with caring for an animal (grooming, feeding, walking, etc.) can provide just enough physical activity to promote a healthy lifestyle. For those that own a dog, two walks a day are vital. It may be because of this that pet ownership has been shown to lower both blood pressure and pulse rate and results in 21 percent fewer visits to the doctor. And what a better way to maintain the correct body weight, a crucial part of maintaining one’s health, than to walk with your best friend? A study conducted on 2,000 people concluded that those who walked their dogs had lower levels of obesity and were more physically active than households without pets. Owning a pet creates the opportunity to meet strangers that become friends. An estimated 62 percent of people with pets say they make it easier to strike up a conversation. Social isolation is common among the elderly, especially those who live alone. As we age, we tend to lose our ability and desire to develop new relationships. Pets (dogs in particular) enhance social opportunities and help seniors stay connected. Whether it’s taking a dog for a walk around the neighborhood or to the vet, there are plenty of ways to stay active and meet new people. For those of you who have a pet, these statistics make perfect sense. Of course, there is the aspect of caring for the pet as well. If your parent has mobility issues, a cat may be a better choice than a dog. If they have decreased energy levels, an older dog may be a wiser choice than a baby pup. Many animals are awaiting homes at the local animal shelter which is often a great place to go with your parent and introduce them to the prospects. What type of pet is best suited for your loved one? Consider the fitness and energy level of your loved one. Dogs require a greater amount of attention and training, while cats and birds tend to be lower maintenance. Judging by this, you can determine which type of pet might be best. Has your loved one cared for an animal before? If not, and your loved one will be the sole caregiver of the animal, the responsibility may be too overwhelming for him or her. Can you (and your loved one) afford to care for a pet? Adopting a pet can be a lifelong commitment, and the annual cost of caring for one can range from $200 to $2,500. Be sure to consider these costs – from vet bills, vaccinations, food, litter, and other supplies. Are allergies a concern? If any member of your household suffers from allergies, pet dander may not be their only concern. Often times, pets will bring outside allergens into the home, tracking in pollen, dust, and mites. Many senior living facilities and nursing homes offer pet visitation therapy, where animals are brought in to provide temporary companionship to residents. Be sure to reach out to see if this service is available in your loved one’s community. Otherwise, your local department of human resources, healthcare providers, and local shelters may be able to offer additional information about these services. If your loved one needs assistance around the home as well as caring for their new pet, consider the aid of a home care services provider. They can assist with daily activities, provide transportation, and accompany your parent and their new pet on daily walks. In addition to providing care, they are another source of the companionship that is so vital to the elderly.